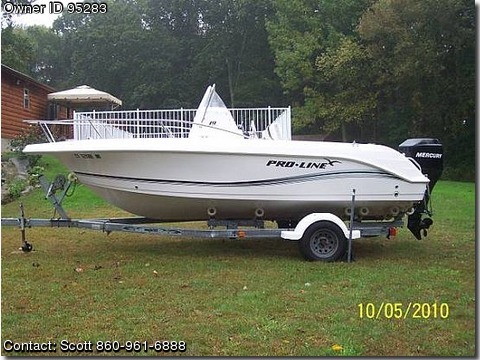 Contact the owner Scott @ 860-961-6888 or scottjw57@comcast.net.2006 Pro-Line Sport 19' Center console w/head & storge under console, 2006 Mercury 115 HP Four Stroke (very low hours) Hydrolic steering, 2006 American Trailor w/electric winch, Bimini Top, HummingBird GPS/Fish Finder Combo, 4 built in pole holders, 4 rail mount pole holders, Live bait well, Sea hose pump for deck, 4 fenders, Anchor w/ 150' braided line, Forward storage, Front seat cushion (new), Safety gear: 7 life jackets, fire ext, flare kit, 1 Seat cover, 1 console cover, 1 Full size winter cover. This boat is clean and in excellent condition, nothing wrong at all. It gets up on level plane fast, motor not oversized perfect fit for boat. Buy this boat and you won't need anything, all set for you to head out on the sound this summer! Serious offers and inquiries only.Reasonable offers will be considered.